Supply chains are the natural work environment for logisticians who strive for their improvement through employing carefully selected methods, tools and concepts with overarching objective of logistics at their heart i.e. to assure product availability in line with predetermined rules. It seems that this environment is going to remain a tangible dimension in which logistics are immersed but also an area subject to optimisation both through theoretical concepts as well as practical endeavours. Assuring efficient flows of materials and information within supply chains poses multiple problems of organisational nature. Hence, transport issues have attained practical, ever-growing importance, but they also have become a conceptual challenge. Therefore, as the instigator behind publishing this body of work and as its Scientific Editor I have decided that these issues are worth of considerable attention that could - perhaps - start an interdisciplinary and international discussion on these matters. By writing interdisciplinary above all I refer to the fact that both economic and technical experts deal with transport issues. The shear diversity of approaches and emphases put on different aspects could have a strong, inspiring effect on the Reader, and it can be the first step towards combining in a creative manner both takes on the matter. 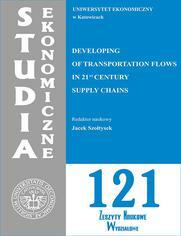 Studia Ekonomiczne nr 121 Zeszyty Naukowe Wydziałowe Uniwersytetu Ekonomicznego w Katowicach.